Algiers: live broadcast studio and ENG camera crew. Algiers, March 2019: News Agency and broadcast services provider New TR has launched its Algiers bureau. Algiers becomes the 14th global news gathering and studio location of New TR, alongside those in prominent cities in Europe (London, Paris, Brussels, Moscow), America (Washington DC and NY) and the Middle East (Riyadh, Jeddah, Doha, Dubai, Kuwait and Bahrain). The Algiers bureau is the first phase of New TR's plan to expand in North Africa. Due to the strict rules surrounding foreign media accreditation, the opening of the Algiers bureau had been in the planning stage for two years but thanks to the efforts of its local colleagues on the ground, New TR was able to start operating this month, in time to coincide with the mass political protests. The bureau is located in west Algiers giving easy access to correspondents and guests. New TR will provide news gathering, news and documentary production and live broadcasts at the facility. 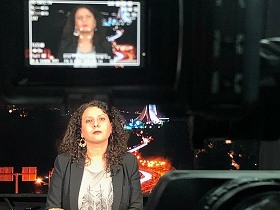 A DTL studio with LED background and a roof position with a live background of Algiers city will be available for live connections for reporters and experts. ENG camera crew, editing and news producer and fixer are the other regular services of the bureau.